Posted September 15, 2016 by The Rapid & filed under News. ArtPrize is just around the corner. Forget driving around downtown Grand Rapids searching for the perfect parking spot. Now, the City of Grand Rapids and The Rapid have made major modifications to the city’s DASH and Silver Line bus services so that parking and getting around the city will be easier than ever before. These new modifications that rolled out recently enable drivers to park in exterior lots and take DASH around downtown free of charge. While the Silver Line’s new No Fare Zone offers a chance individuals to get around downtown at no cost! 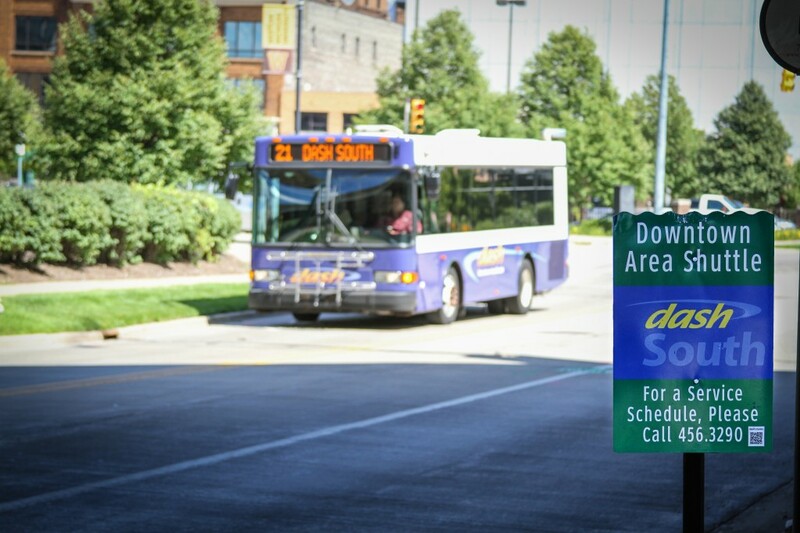 Whether you’re riding in from 60th Street after parking your car or just hopping on board to head to lunch, the Silver Line’s No Fare Zone offers an easy and cheap way to experience downtown. The Silver Line No Fare Zone encompasses Silver Line Stations from Rapid Central Station to Wealthy Street Station. The improvements to the DASH shuttle service took elements of DASH Hill and South have consolidated them into the new DASH West route. DASH North will only have minor changes. Take a look at the new map. The new routes are marked in red and blue and the city’s parking lots are labeled in grey. The city’s Mobile GR and Parking Services Department are currently funding the pilot project.